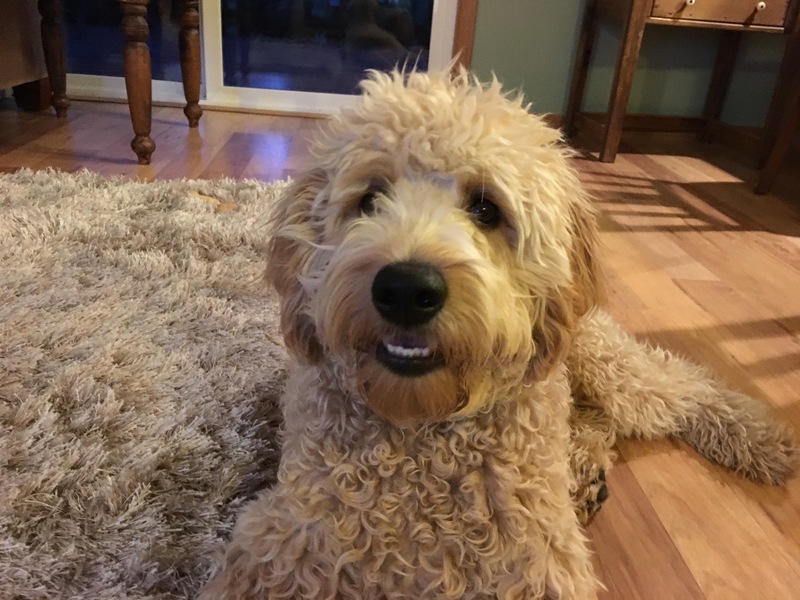 Hank is a seven-month-old mini Goldendoodle who is high energy, doesn’t always respect or listen to his guardians, counter surfs and steals / chews things left on the floor. Golden doodles are a very popular new breed due to their coat not shedding. However, they come from Labradors who are some of the most energetic and rambunctious puppies around. If properly socialized as a puppy through puppy socialization classes, they usually learn that certain behaviors (mouthing, biting, etc) are unwanted and stop engaging in them. But because Hank has not participated in puppy socialization classes, he was more ornery than the norm. His guardians had been taking him out for a 30 minute run in the AM and a walk in the evenings, but for high energy Hank, this just wasn’t enough. As you can see from the way Hank greeted me when I arrived for the session, he is sorely in need of more exercise. An average puppy needs 45 minutes of good exercise a day. But higher energy dogs can need much more. It only took a few minutes to understand that Hank (and his guardians) would benefit from some additional exercise activities. I have found a great way to burn excess energy is through the fetch; something most Labs will do until they drop. While walks and runs are great and important (especially a structured walk where the dog is at a heel) for obedience, they aren’t much of a challenge for dogs who are much better athlete that we are. The fetch taps into their pursuit mode and they end up releasing a lot of energy with that adrenaline release. I suggested that they practice the fetch before taking Hank for a jog or walk (waiting a few minutes after for the dog to recover) as well as any time that the dog starts to get ornery. I also suggested that they chart the number of fetches along with the result on the dog and its behavior. I have a Border Collie / Lab / Pointer / Dalmatian mix who is extremely high energy. Before we started with the fetching regimen, she went through a few couches, remote controls, dog beds, etc. But once I found that if I fetch her 41 times each day (Takes about 13 minutes), her energy and behavior are fine, i made that a part of our daily routine. Im guessing for Hank, it will be a few fetching sessions each day. The morning one should be the longest and then the guardians can supplement it with shorter 5-7 minute fetch sessions after that on a as-needed basis. By charting the number of fetches and resulting behavior for a week or so, they will be able to determine exactly how much exercise Hank needs to deplete his excess energy. Once inside Hank was still hyped up and unruly so I pulled out a leash and used it to give him a doggy time out to disagree with his over excited behavior. While the leash settled down Hank quite a bit, you can see that he is still breathing pretty heavily, something his guardian said was the norm. This is often the case for high energy dogs who don’t get the physical release of energy they need. One of my favorite activities to showing a client how to claim the door from their dog. We arranged for the mother of one of Hank’s guardian’s to come over so I could show her how to claim the area around the front door and keep Hank back. While I made some progress in changing Hank’s behavior, I ended up stopping the exercise after a few minutes. Usually I am able to achieve an almost completely transformation with this exercise, but in Hank’s case his unspent energy was too much to overcome. Often a dog is territorial at the door because he thinks he is in a position of authority, But in Hank’s case, he was simply excited that someone new was arriving. Don’t get me wrong, Hank also thinks he has more authority than he actually has, but the pressing issue was the over excited energy. This over excited, barking and jumping behavior is usually developed when the humans in the home give the dog attention and affection as soon as they get home or on demand. But when we pet a dog or give it attention when its in an excited or unbalanced state, we are actually reinforcing that behavior. By petting the dog upon arrival, the humans were inadvertantly training the dog to jump up or get excited as a way of asking for attention. I suggested that they refrain from giving the dog attention or affection unless he is in a calm frame of mind. If they do this consistently, he will learn he needs to settle down and remain calm in order to get attention from the humans. In reviewing myself in the door answering footage, I identified a few mistakes I made. The primary error was not stopping and waiting for the dog to stop, sit or calm down more before I moved backward towards the door. If a dog is moving forward and we back up, we are inviting the dog to come forward. For this reason, its important that the dog is in a calm and stationary position before we back away to the door. Once the guardians find the right amount of exercise to fulfill Hank’s daily need, they can return to this exercise and practice answering the door with the dog behind the boundary. Usually this exercise only needs to be practiced 6-12 times before a dog adopts a new behavior and sits calmly past the boundary near the door. I was frustrated by how the door claiming exercise had gone as this was the first time I had not been able to achieve the end result I wanted. As I discussed the dog’s energy and day to day activities, his guardian mentioned the dog was also very excited when she came home; almost exploding out of the kennel. I showed the guardian how to black Hank from exiting the kennel until he was completely calm, then coached her through the technique until she got the same result. While the surplus of unspent energy was the primary factor in many of Hank’s issues, a close second was his lack of self control. Practicing this kennel release exercise will go a long way towards the dog developing the ability to control himself for longer periods of time. Dogs are reactive creatures who literally leap before they consider all the options. I have had great success in adding in structure to activities the dog is very excited about like going for walks, feeding time, fetch, etc. By stopping and waiting for the dog to return to a completely calm state before starting the walk, getting permission to eat or throwing the ball again – we can help the dog learn that he needs to be calm in order to continue. After going outside to practice some of the fetch, I showed the guardian how to make a simple exercise out of going in or out of the door to the back yard. While asking the dog to wait and calm down seems like a minor deal, when its done in actions and activities the dog engages in often, the cumulative results have a major impact on the dog. These are the little things we can do that help the dog learn the behavior we expect from it. By the end of the session, Hank was calmer and showing more respect for his guardian, but there is still a ways to go. If they increase his daily exercise and go to the fetch when the dog gets into trouble or gets over excited, they should notice an immediate improvement in the quality of life. Its going to take a few days of trying different amounts of fetching to come up with the right cocktail. But once that is the case, it will be much easier to disagree with Hank’s unwanted behaviors and get the response from the dog that they want.